The Hawai’i Alliance for Community-Based Economic Development has been experimenting with strategies that both Alperovitz and Cohen would find worthwhile. 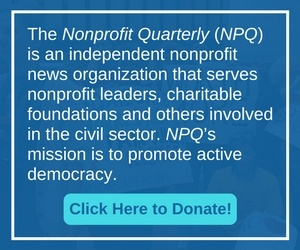 Welcome to the Summer 2005 issue of the Nonprofit Quarterly. This issue was to have been our annual philanthropy edition, but as we considered the challenges of the current economic and political climate, that topic seemed a bit inadequate. In fact, the impact of philanthropic trends pales in the shadow of the larger economic and political trends in this country. These trends, of course, are connected to and generative of larger worldwide trends. In short, despite the fact that the number of organizations in our sector continues to increase, as does the amount of money we control, the wealth gap and the inequities that flow from that have also increased. Is the way we are currently using the capital available to us working during a period of declining social spending and greater inequality? Gar Alperovitz poses another way that might more effectively enhance community wellbeing. Mid-Iowa Community Action’s (MICA) work with the boards of community action agencies provides readers with a valuable perspective on the systemic problems faced by boards that lead to ineffectiveness and, perhaps, crisis. The economy is recovering, but is the nonprofit sector? It depends on where you sit. Why are some nonprofits thriving while others are just surviving? Renz provides a different framework for thinking about the tradeoffs between different funding sources and their influence on the organization. For three years now, the Nonprofit Quarterly has charted the progress and response of five nonprofits as they have creatively confronted shifts in the environment. A little over a year since our last update, each of these organizations has something to teach the rest of us. We asked some well-known fundraising advisors help us identify groups doing a good job with grassroots fundraising. We didn’t want fancy but we did want effective.